Our range of products include reversing camera system. The 180°horizontal rear view provides a 3M wide and infinity long view and the 180°bird’s eye view provides a view of 3M side and 1M long. The processed image not only allows operator to see the wider and longer view with no blind spot on both sides of the vehicle bumper but also gives driver a better idea on the distant relationship between two objects appeared in the display image. Therefore, any objects behind the vehicle can be seen clearly and driver can make a more precise judgment of space between objects and the vehicle easily. 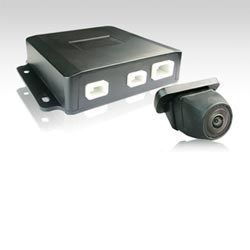 Looking for Fullview Reversing Camera System ?